The Institute for Mathematics and Computer Science (IMACS) is pleased to announce Elements of Mathematics: Foundations, a new series of online courses designed for bright secondary school students. EMF is a self-contained program that allows the talented student to complete all of middle and high school mathematics up to Calculus before leaving middle school. The curriculum is the result of more than a decade of research and development by an international team of mathematicians and educators and has been in use with gifted and talented students for over 20 years. For mathematically talented schoolchildren, subject acceleration is an oft-advised tool for addressing their need to learn more challenging material. Through subject acceleration, a student works on math curriculum that is normally taught at a higher grade level. While acceleration does help bright students avoid repetition of material in which they are already proficient, by definition it cannot help them avoid the tedium that is the standard US mathematics curriculum. EMF is not an accelerated version of the standard US mathematics curriculum. Instead it provides a deep and intuitive understanding of foundational concepts. This allows the suitably talented child to progress quickly through material for which others would require significant drill and practice. The curriculum then proceeds to cover concepts in a mathematically consistent way, going well beyond the typical gifted math class offered in schools or online. Topics from the standard curriculum – and much, much more – are taught in an intellectually engaging way. • The EMF curriculum was designed from scratch specifically for gifted and talented children to leverage their advanced capacity for learning and to engage their unique ways of thinking. • EMF provides a deep, intuitive, and lasting understanding of mathematics as a cohesive body of knowledge that opens the door to scientific discovery and technological advancement. • EMF focuses on the powerful and elegant ideas of mathematics, the kind that gifted and talented children find deeply satisfying and inspiring. • The EMF curriculum exposes students to subject areas not found in the standard curriculum such as operational systems, set theory, number theory, abstract algebra, and probability and statistics. • EMF maintains a level of mathematical rigor found typically at the university level while making advanced concepts accessible and fun for a younger audience. • EMF gives students a true sense of what it takes to excel in college math courses, which is not the same as the skills needed to do well in standard math classes or at math competitions. EMF students do not have to “unlearn” certain habits before they can move forward with more rigorous math courses. Is EMF Right For Your Child? EMF courses are self-study and require a certain level of intellectual maturity. Talented students who have completed all of elementary school math but have not yet completed algebra and geometry would gain the most from EMF. However, students who already have some experience of algebra and/or geometry may still find benefit because EMF introduces concepts that are not covered in standard high school mathematics classes. 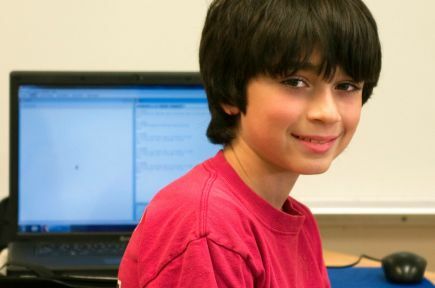 Parents who register their child at www.elementsofmathematics.com will be offered the option of having their child take a free online aptitude test to help determine their child’s level of readiness. Elements of Mathematics: Foundations, the most advanced mathematics curriculum ever devised for talented secondary school students, is now available online. Register at www.elementsofmathematics.com. Like IMACS on Facebook for the latest information about our local classes and online courses.